Every year in May, the honey harvesting season in begins in the Casamance region of Senegal. 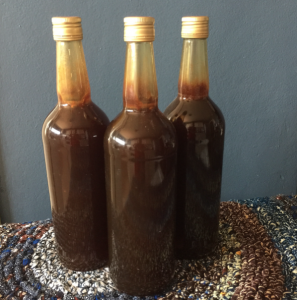 In 2016, a widow and mother of three gathered her savings and purchased 36 liters of this renowned honey to resell in the capital city of Dakar. Her plan was to wait until the season ended and sell it for a profit when supply became scarce, but people still wanted the sweet stuff. It was a good business plan, one we wanted to support. With a $1000 microloan from Kayoong Community, Mme Diatta was able to multiply her business eight times over! In case you haven’t ever seen 288 liters of honey, that’s a lot of honey. Mme Diatta paid back the microloan on time each month and she sold every last drop of the honey. Plus she earned a strong reputation as a honey supplier in the community because the quality and purity of her product was impeccable. In 2018, she was able to increase her business again through a second microloan and purchased 378 liters of honey – and is well on her way to selling out again!